The publicity secretary of the All Progressive Grand Alliance APGA, Anambra state, Comrade Chinedu kwonta has expressed confidence that Chief Victor Umeh will win the February 22nd Re-Run Senatorial election in Anambra central senatorial district. He said the party has consistently commanded dominant control of the state affairs for over ten years and remains the only party that Ndigbo see as their rallying point to deliver dividend of democracy to the people of south eastern part of Nigeria. Kwonta stated this at a media interaction with journalists in Awka, debunked the rumour making round that Senator Uche Ekwunife’s defection to the All Progressive Congress APC would deter the party from commanding the loyalty of the party in the state as it were. 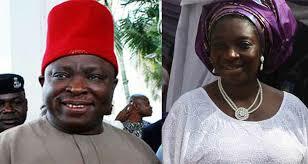 He maintained that though, Senator Uche Ekwunife’s defection to the APC is her constitutional right of freedom of association and movement but would in no way deceived the people of Anambra state from voting for a party that is alien to Igbo ideology. APGA publicity secretary reiterated that Ndi-Igbo have learnt from their past mistakes and so recent was the support for President Goodluck Jonathan in the 2015 general elections which cost them major seats at the national assembly but now have taken a step backward to promote what is theirs; as the Hausa and Yoruba are currently celebrating APC as their party. His words” “Everyone has a right to want to belong to any political party in the nation, as in this particular case of Senator Iyom Ekwunife going to APC; it is her fundamental human right”. “In terms of running for the senatorial seat for the central zone of Anambra state, I do not think that is tenable in law”. “I am not a very legal person, but am a media person, but I must tell you that the position of the law will have to be sought to the maximum by our political party that is the All Progressive Grand Alliance (APGA) to make sure that she qualifies from which ever angle or whichever political party that she is coming to run” . “Let me say clearly that APGA as a political party that is in charge of the affairs and working government in Anambra state is not scared of anybody, we are not competing with any political party as far as Anambra state is concern and indeed the south east will become very soon”. “We would love the people that feel they have gotten all the political convenience or ingredients that makes them what they think they are, to come into Anambra state to come and compete with us, we will show them , because this place is the natural habitat of the ALL Progressive Grand Alliance APGA”. “It is so because we have consistently worked for the people of Anambra state under the previous governor and under the able and dynamic working BOT chairman and governor of Anambra state, Chief Dr. Willie Obiano, he has done fantastically well and APGA keeps getting better and better for Ndi-Anambra”. “During this last return, Anambra remain calm, there is no single account or incident of kidnapping and robbery, the government is working for the people, we are not scared and that is why!”. He stated further that the election between Senator Uche Ekwunife and Chief Sir Victor Umeh is beyond a contest between APGA and the APC but according to him, it is an Igbo survival election, where competent hands would be sent to the National Assembly to represent and reflect the true Igbo influence to the Nigeria community and that has remained the only solution to settle the Igbo quest for solution to Nigeria context. “I must tell you the position of Ndi-Igbo as a people: we know how precarious, we know how dicey our position as a people is in this country of today”. “What we need now is our first eleven to represent us at the centre, and it cannot get better than our former national chairman, a proven, a tested and a courageous man; a man that has shown the honour he is made of , in the person of chief Sir Victor Umeh, this man is a genuine Igbo man to the core. If you have not seen an Igbo man before, look at his long cap, it is the symbol of his Igboness”. “We are not scared, what we need is a proper representation, somebody that will go to the National Assembly to go and tell the truth to Nigerians so that the Ndi-Igbo will reclaim their position”. “You know the tripod that made up Nigeria; you talk about the Hausa, the Yoruba and the Igbo, we are the Igbo today? “It is because we have been sending some kind of not perfect human being. I am not saying Chief Victor Umeh is perfect but am saying that he has all the ingredients that can ginger his colleagues, our able honourable members in the House of representatives and in the senate, he has that charisma that his presence in the senate will make people do better and he has the ability to build bridges and to cut across different tribes to enable them to work with us” . “Politics is about the movement, it is about the political trading. Victor Umeh is too experienced!”. “It is not about Ananmbra central senatorial election, but it is an Igbo election, people are calling us from all over the world and entire south east that they are interested in this election, so we are not scared of anybody, anybody can join ship with any political part they want, we will be very glad to compete with them in Anambra state”. “There is no competition, we are in charge! Ohamadike is the candidate to beat, because he is a man of value, a man of courage and he is a man that understands the problems of Igbo man and a man that is tested and trusted. “ Kwonta submitted.